Director Tony Catter and CAI Studio Pictures debut film project THE THREE HARES has completed its first step towards a feature film goal with a release of its highly anticipated lofty proof-of-concept short today, October 31 2016, All Hallow’s Eve. THE THREE HARES was filmed entirely in Oxfordshire and Gloucestershire England with all post done in Los Angeles at CAI Studio. 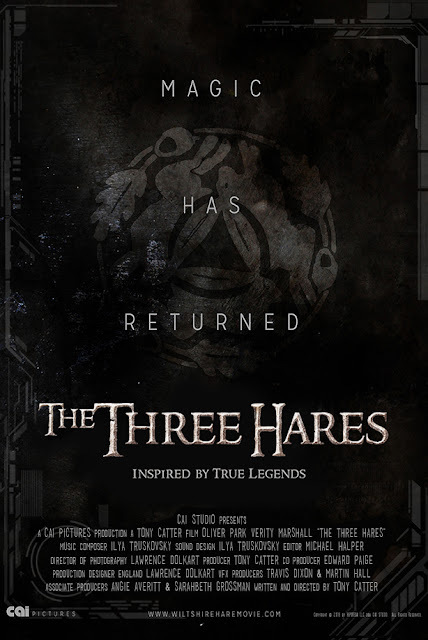 Set in Wiltshire, England in the year 2023 and starring Oliver Park, THE THREE HARES is a dark fantasy proof-of-concept short. After a long absence, magic has returned to England – with dire consequences. THE THREE HARES is based on true untold legends of the west country of England. Many have seen the magical shape-shifting witch hares, but few have lived to tell the tales. Mystery further surrounds the revered Chinese Three Hares Insignia, found in churches across England; three hares entwined in a circle connected by their ears, whose true meaning is lost to the sands of time and the Silk Road. The Three Hares from CAI Studio on Vimeo.